My experiences with turkey as a stand in for red meat haven’t always been so terrific. The flavorless, dry turkey burger will never beat a juicy, carnivorous, extra-large greasy burger from your favorite burger joint. But when done right, a great turkey burger topped with all kinds of deliciousness can stand up to any beef burger in my book. Lucky for me, one of our favorite local restaurants, Bowman’s Tavern, serves a damn good burger – turkey or otherwise. Bowman’s Tavern in New Hope is top of my list for honestly, just about everything. This little hide away spot on River Road is the place you’ll find my husband and I many a Friday or Saturday night. I’ll be sitting at the bar, drinking a Victory Headwaters and eating a turkey burger. The perfect way to kickoff a weekend. Friday nights they have a piano bar if you want to belt-out some show tunes after a few cocktails. 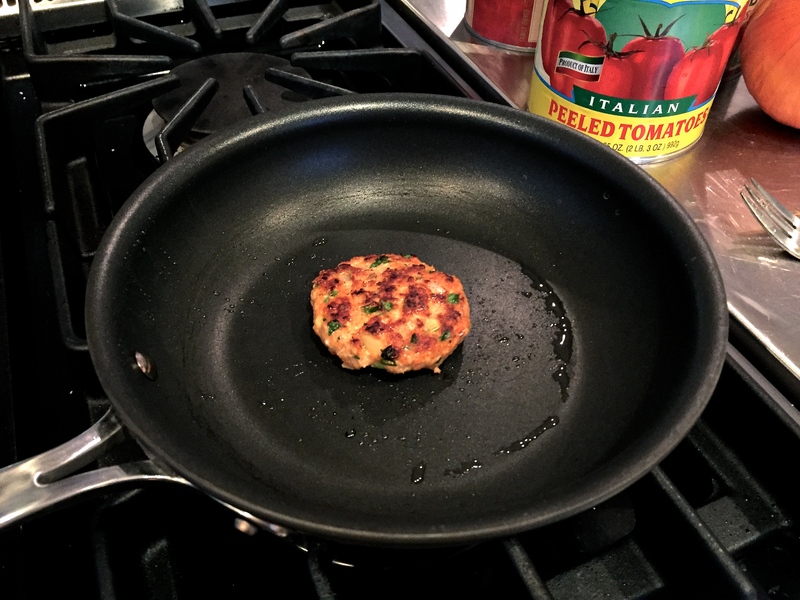 Thinking about Bowman’s killer turkey burger inspired me to apply the same logic to meatballs. 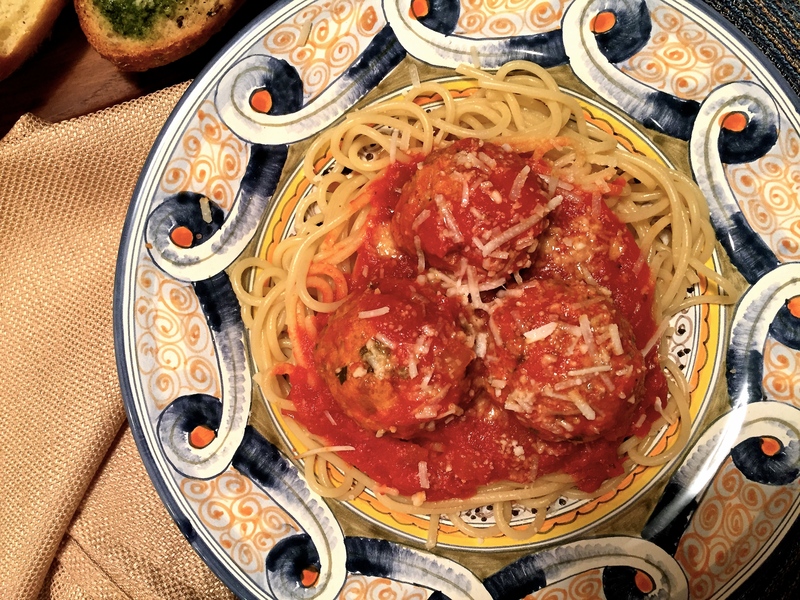 A skeptical, red meat loving, Italian-o-file of a husband couldn’t sway me – but I was going to make awesome turkey meatballs and he was going to eat them! In a quest to make sure they were moist and flavorful I decided to mix half ground turkey and half spicy turkey Italian sausage. I prefer Martin’s brand Italian turkey sausage. 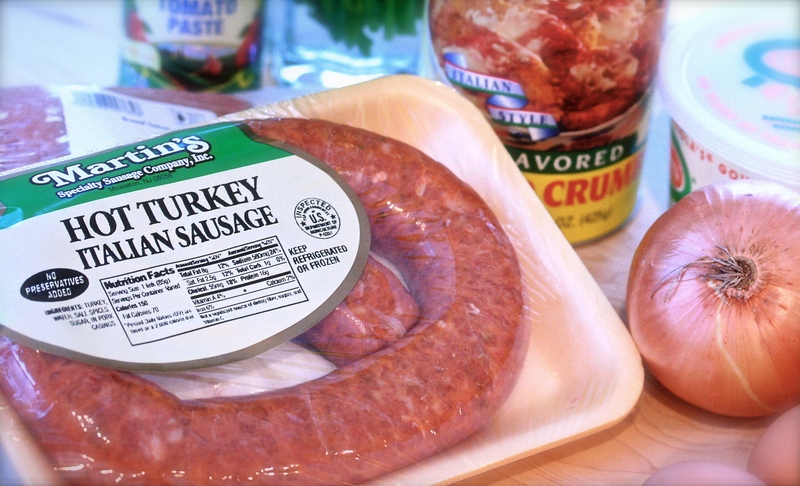 While many of the brands miss the mark on authentic Italian sausage flavor, Martin’s wins the prize. I buy Martin’s at None Such Farms. Sadly, I did find after poking around online at other turkey meatball recipes, Giada has a recipe using a similar combination of ingredients. I thought I was being so creative. With that said, I will say this recipe was adapted from her just to make sure I acknowledge that we are of equal genius in the kitchen. Ha! Preheat your oven to 400 degrees and line a sheet pan with aluminum foil. Brush the foil with olive oil and set the pan aside. Combine all the ingredients up to and including the garlic in a large bowl. Add the two meats and using your hands, mix everything together being sure the sausage meat is evenly incorporated throughout the mixture. Add some salt and pepper. Start to add water to the bowl a few tablespoons at a time, mushing the meat mixture with your hands. You want it to be fairly wet and sticky. You shouldn’t need more than a 1/4 cup of water and may even need less. 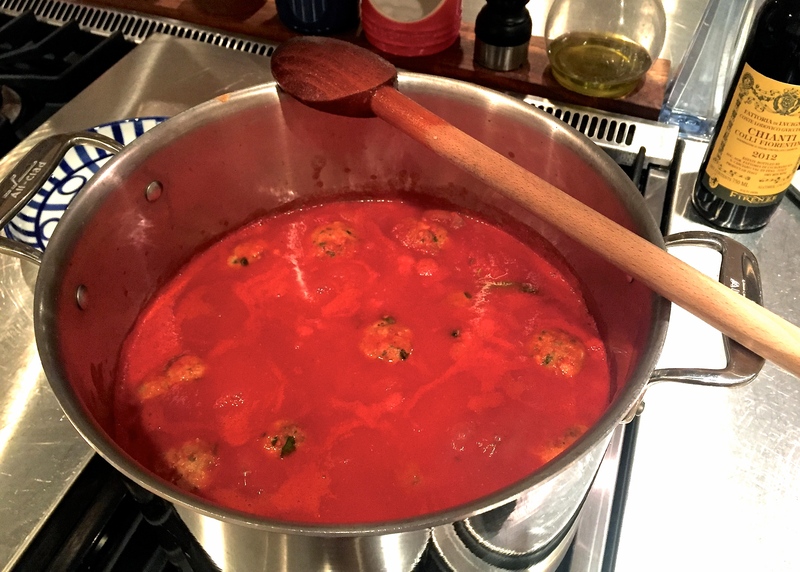 Water is the trick I also use for my meatballs marinara, it keeps them moist and delicious every time. 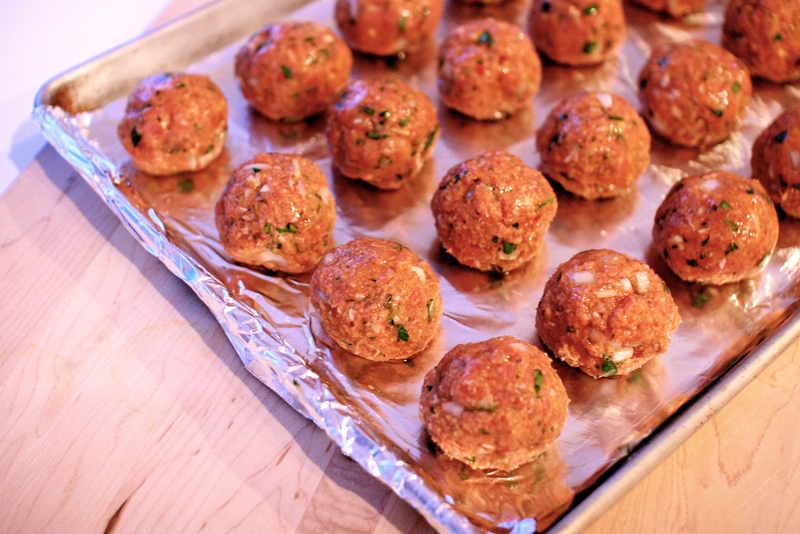 Form your meatballs and place them on the sheet pan. I make them the size of golf balls. 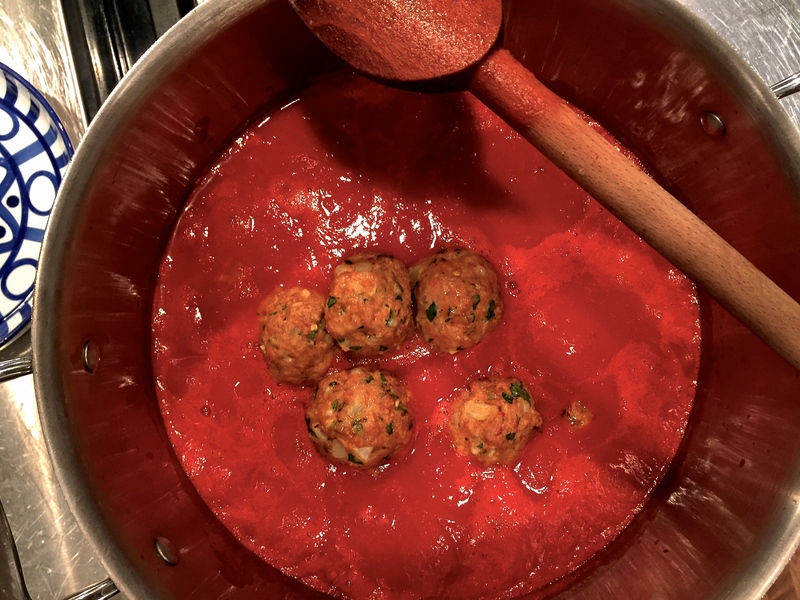 Once done, brush the top of each meatball with a little olive oil and place the pan in a preheated oven for 20-25 minutes. 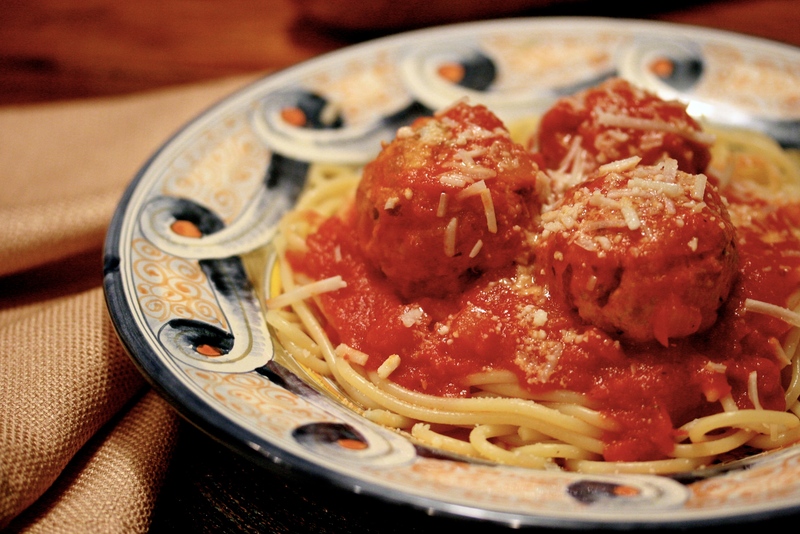 While you’re waiting for your meatballs to cook, throw together a big pot of marinara sauce. Use your favorite recipe, my recipe or even a couple of jars of your favorite sauce (we’ll never tell). When the meatballs are done, remove the sheet pan from the oven and using a spatula, gently lift them from the foil and put them in the pot with the sauce. Now just sit back and relax. Let the meatballs simmer in the sauce for a nice long time. I say at least 1 hour is fine but 2 hours is awesome. The word cacciatora means “huntsmen-style,” in Italian. 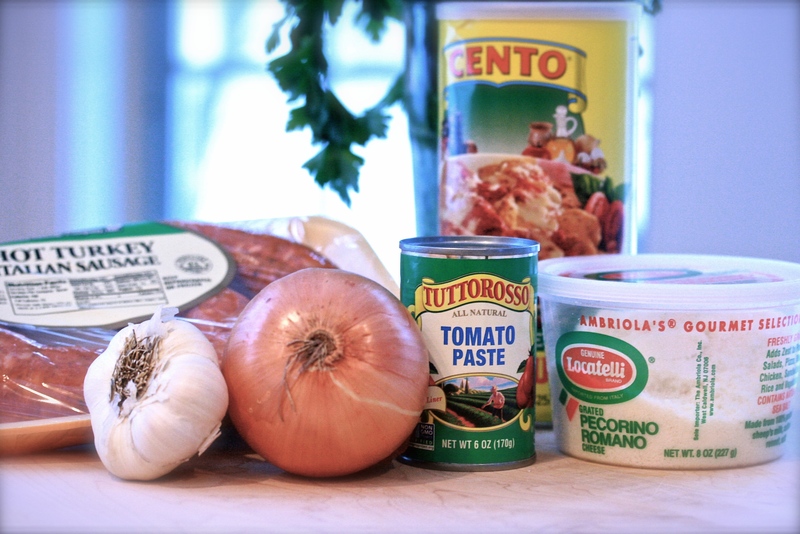 According to Amy Poehler and Aziz Ansari from the show Parks and Recreation, cacciatore is called “chickie catch.” Chef Todd English explains the original chicken cacciatore did not have tomatoes, but used only vinegar or wine, resulting in a darker sauce. Bobby Flay adds jalapeño, Emeril uses cremini mushrooms and only chicken thighs, and The Pioneer Woman uses turmeric and egg noodles. I suspect as long as the dish includes some combination of chicken, peppers, mushrooms, garlic and onions, everyone is headed in the right direction. 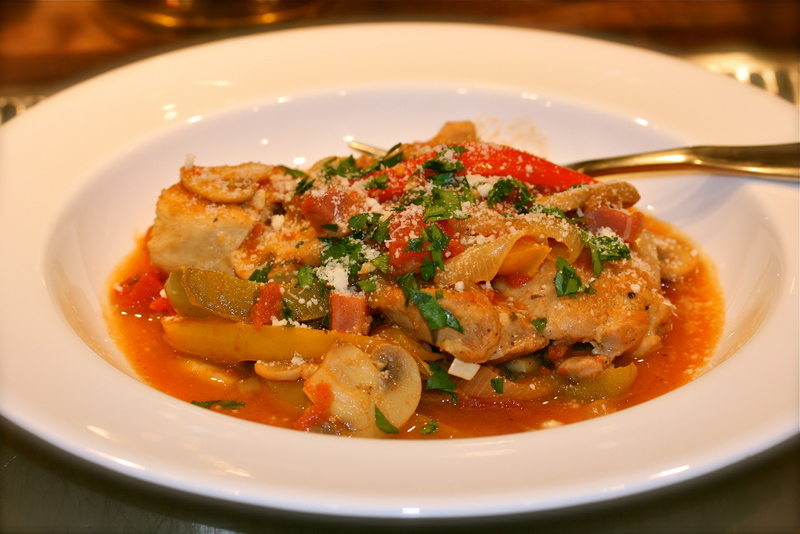 For me, chicken cacciatore is the perfect hearty dish on a chilly night. I load mine up with lots of colorful bell peppers, diced pancetta and hot cherry peppers. The pancetta adds a deeper, rich flavor, and the hot cherry peppers give it a major kick – we love that heat! 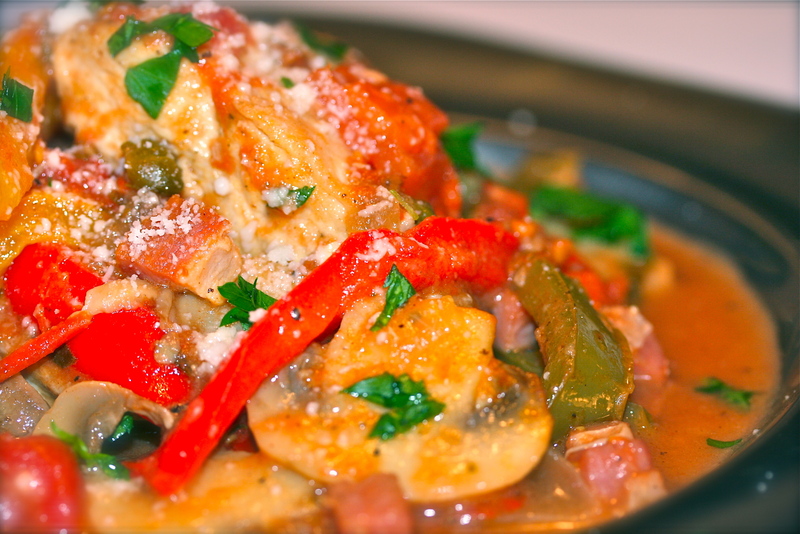 It’s fun to peek around on the internet and see the different versions of cacciatore making their appearance online. We really enjoyed this 4plates2table huntsmen-style chicken. Don’t be alarmed by the long list of ingredients. This dish is easy to make and leftovers are super delicious, too. Rinse and pat dry the chicken. Dust with Wondra flour or regular flour and sprinkle with salt and pepper. Set aside. Heat a large sauté pan (6qt) over medium-high heat and add a little olive oil. Brown the chicken about 3-4 minutes per side and remove from the pan, set aside. Don’t overcrowd the pan, work in batches if necessary. Add the diced pancetta to the same pan and sauté until it begins to crisp, remove from the pan and set aside. Add the onions and peppers and sauté until they begin to soften. Add in the mushrooms and sauté until they release their juices, scraping up the brown bits in the bottom of the pan as you go. Add the garlic, cook for one minute until fragrant. Add the hot cherry peppers, capers, wine and tomatoes. Stir well to combine. Nestle the chicken pieces back into the pan. Toss in the crisp pancetta, thyme bundle, and chopped oregano. Cover and simmer for about 20-30 minutes or until the chicken is cooked through. Sprinkle with fresh parsley and serve with grated parmesan on the side. * This would be delicious served over pasta, polenta or with just a rustic baguette on the side.